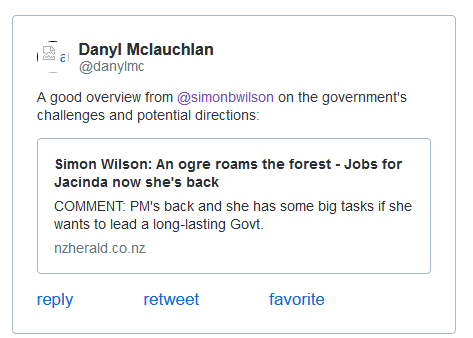 My last post highlighted how Simon Wilson claimed in a column in today's NZ Herald that the average teacher age in New Zealand is 57. That’s true, and we will get to those. We’re talking about the level of remuneration right now. Under your offer, how much will an average teacher get extra? It depends, because through the Ministry of Education, the offer has been loaded up at the beginning-teacher salary rate. So a beginning teacher, for example, stands to gain almost 15 per cent increase over three years. Those more experienced teachers would get less under the offer that’s on the table at the moment. And the majority of those teachers are the more experienced teachers. The average age is 57 or something like that. They’re higher into the pay scale. So do you know how much they’re going to get? Again, it depends on where they’re at on the salary scale, but also about 40 per cent of primary school teachers are earning over the top of the salary scale because they have additional allowances or additional management units or whatever. So it’s quite difficult to put nice clean numbers on it, because the pay scale and the pay system for teachers is quite a complex one. This morning I linked to data from 2008 which showed the average age was 44.5. After further probing I have data from the OECD showing the average teacher age in 2015 was 45. What you would expect based on the 2008 number. At this rate, the average age won't be 57 until 2183 AD.... or thereabouts. My guess is that The Nation presenter simply repeated what he read in the NZ Herald. 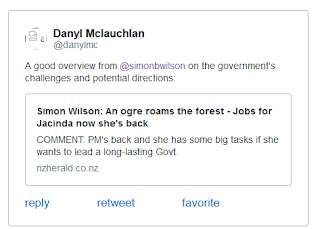 Don't think I have come across this commentator before - Simon Wilson writing in the NZ Herald. All gloom and doom and crisis, crisis. "Council of Trade Unions (CTU) economist Bill Rosenberg calls it a "hollowing out of the wage scale". Inequality is growing and the people taking the biggest hit are those in the middle and the lower middle. Mostly, that includes self-employed people. It's worse for non-working beneficiaries. We don't have a DPB (Domestic Purposes Benefit) any more, but there is an equivalent payment package in the benefit system. Rosenberg has calculated that even if we raised that payment by 25 per cent, it would still be no higher, in relation to the average wage, than the level it was cut to in 1991. For the single unemployed and invalids, benefits would need to rise by even more." But is it facile to talk about just the benefit payment when there are other substantial add-ons. Someone who has a baby and is on a benefit now receives $151 a week for that child. If they have other children they will receive substantial further payments for each child and, and if they live in Auckland, can claim up to $305 in accommodation supplement. As for overall income inequality you don't have to understand all the jargon and workings. If you can tell whether a trendline is going up or down you can see that the official stats show that inequality is not rising. And he hasn't got other facts right. "The average age of teachers is 57.5 years." He is so out of touch and would know this if he spent any time around primary schools. "...the average age of teachers has remained relatively steady at 44 for the past eight years; for the current period the average age is 44.5 years." "So what's next? What about Children First? A programmatic approach that says we identify what children need, from conception, make sure they have somewhere to live where they are warm, dry, safe and preferably loved, and wrap the services around them that will allow them to prosper ... through pre-school and school and into tertiary education or work, and especially if they are abused at home, if they have mental health issues, if they get in trouble with the law." Identifying and targeting is exactly what Bill English was doing. It is exactly what Whanau Ora services are doing right now. "There is rage in the world. Rage in this country too. The big task for Jacinda Ardern and her Government is to set us on a path where hope subsumes the rage." Yes. I get pretty annoyed when I read hyperbole unsupported by facts. It may be a "good" overview if it confirms lazy prejudices but it is not an honest overview. "Years of neglect and our schools are now in crisis" he writes. Even Chris Hipkins, on telly, has just denied that the education sector is "in crisis". I added 'apparently' because you never know what lengths these obsessives will go to. I've always had a lot of time for young Rick Giles. Involved first with the Libertarianz and then ACT on Campus, he's quirky, mercurial and acutely intelligent. This video about baby boomers and parenting is challenging but also manages to be very humorous. I have advised he check his own collectivism (after railing against it during the commentary) regarding labeling an entire generation.